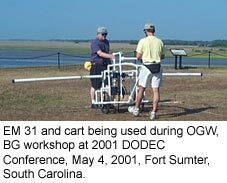 Applied geophysics research at OGW BG focuses on the development and modification of geophysical characterization and monitoring methods and on the testing of newly developed and emerging geophysical technologies. 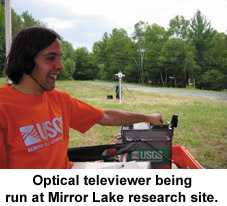 OGW BG uses a variety of geophysical methods and techniques in its ongoing research and training courses. 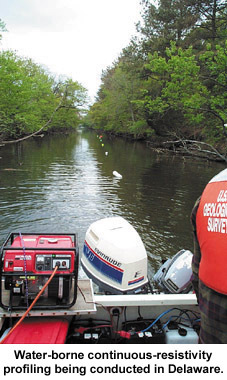 Below is a listing of the surface, borehole, and water-borne geophysical methods supported by OGW BG, including emerging techniques under development. 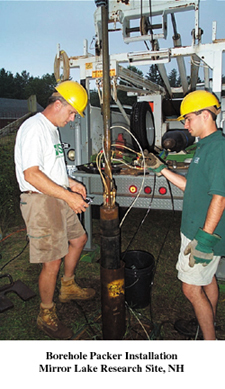 The Branch also supports selected methods for hydraulic testing in boreholes that are commonly used in conjunction with borehole geophysical methods. For additional information and online support materials for many of these methods, see the OGW BG online technology training and transfer information. Hypertext links and other references to non-USGS products, trade names, and (or) services are provided for information purposes only and do not constitute endorsement or warranty, express or implied, by the USGS, USDOI, or U.S. Government, as to their suitability, content, usefulness, functioning, completeness, or accuracy.